FEBRUARY 2007 -- No matter how small or large your Grange is everyone can make a difference in their community. The key to any good community service project is planning. Determine how many people in your Grange are able to contribute to a project. This will give you an idea on the size project you may want to tackle. Be careful not to take on something too large for your Grange to handle. Some people may not be able to physically help with some of the heavier labor tasks but many people can help make advertising flyers, bake cookies, or sponsor a walker in a walk-a-thon. Remember, it is always best to include as many people as possible. To start the planning process we have listed below a few ideas you may want to consider when selecting a community service project. But remember, this is just a list of suggestions, you my choose any project that your Grange likes or is better suited to your community. • Schools - Find out if your local schools need volunteers to help with community service and other projects. Students can also assist you with local clean-ups, suppers or other activities in your Grange. • Volunteer at your local public radio or television station - they are always seeking people to assist with their fundraising efforts. • Provide educational programs for members of your community - AARP 55 Alive, Stay Alive, Drive 25, Identity Theft, Nutritional Information. • Holiday Gift Baskets - for local needy families or members of the elderly in your community. • Pet Food Drive - supply pet food for the elderly or assist with their pets. 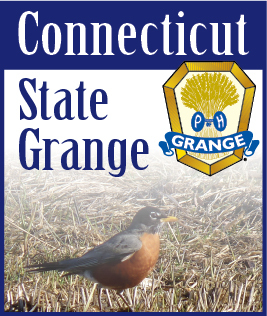 • Postcards - Send postcards to elderly shut-ins in your Grange and your community. • School Supplies - raise money or collect school supplies for donation to local schools. Remember, that mid-year is often a difficult time for schools. • Holidays - remember those less fortunate by holding a free supper or raising gifts for needy families. Please contact us if you have questions or need assistance in starting your new community service projects.